I’ve been asked about the person to whom Kiki Strike is dedicated. This story is far too long for one post, but I’ll try to give you the basic facts. Caroline McDonald was an Australian citizen, a world-class athlete, and a good friend to the Irregulars. Kiki and I first met her two years ago when she was shoved in front of a speeding subway train. You don’t tend to forget such events, and I can still recall the evening in question in remarkable detail. It was shortly after 10 PM, and we were at the Union Square Station in downtown Manhattan, waiting for the number 5 train. A small, athletic-looking girl stood to our left, eating from a jumbo package of pork rinds. I remember marveling at her appetite. The girl could really pack it away. Just as the train rounded the bend, a massive man in a hooded sweatshirt rose from a nearby bench and hurried in the direction of the tracks. I didn’t think much of it—the only people in New York who aren’t in a rush are the tourists. So I was shocked to see Kiki bolt toward the man with her fists clenched. She didn’t reach him in time. With one quick shove, he pushed the hungry girl onto the train tracks. If you read the papers, you may have heard the rest of the story. Thanks to her remarkable presence of mind and athletic training, Caroline had managed to roll in-between the tracks. The train missed her by inches. Her assailant was a college student named Eric Littleton. He and Caroline were both stars of the school’s renowned track team—a team Caroline was about to expose for its abuse of an illegal (yet undetectable) synthetic steroid. Even with Eric Littleton (and two of his track coaches) in jail, Caroline’s life was still in danger. The Irregulars were happy to serve as her bodyguards—largely because she was so entertaining to have around. She regaled us with stories of Australia’s deadly wildlife and introduced us to a culinary wonder known as a meat pie. I coached her to fourth prize in the Coney Island hot dog eating contest, and she was the first person to read Kiki Strike: Inside the Shadow City. Without her help, I don’t know if Kirsten Miller and I could have convinced the Irregulars to let the book be published. Six months after the subway incident, Caroline decided it was time to go home to her beloved Australia. The last time we saw her was when she stepped into an airport-bound taxi. 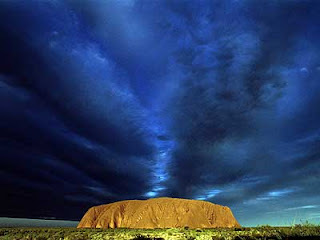 Two weeks later, she disappeared on a camping trip near Uluru (otherwise known as Ayres Rock). The official story is that dingos were to blame, but the Irregulars suspect foul play and are still investigating. P.S. when will the new sequel come out? FYI: unless something strange happens (which is always a possibility) the next book should be out in the fall. are people going to be able to pre-perchase it online? great story, and it really worked lying between the tracks? wow, thats just amazing! you have an amazing past you know that?! looking forward to more of your adventures!